England, it seems to me, is a land of rules. Before I arrived here, one of the first things I told people about my impending trip to Oxford was that students aren’t allowed to walk on the grass. Coming from Princeton, where as soon as the temperature gets above sixty-two it seems like the entire student body busts out bikinis and Frisbees and collectively flops on the lawn, this struck me as pretty amusing. 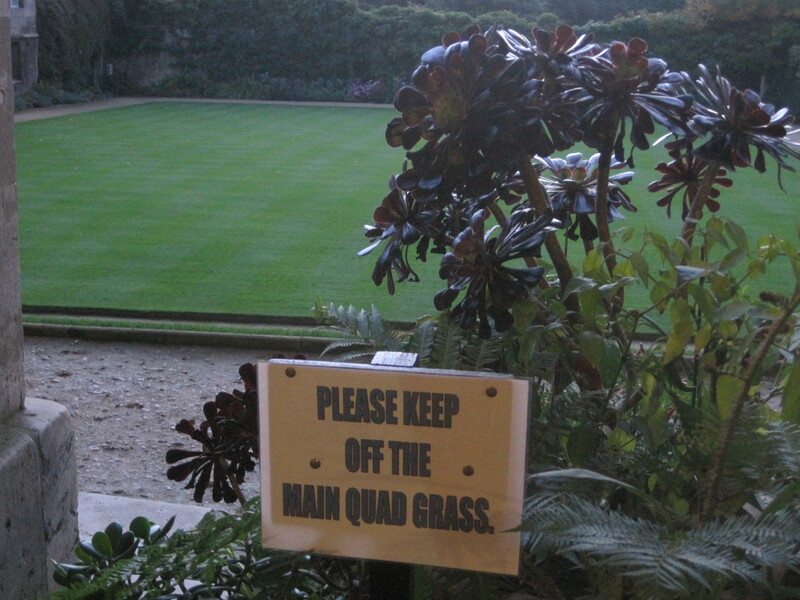 I wasn’t entirely sure how serious Oxford was about this rule, though, until last week, when I was showing my parents around the Worcester Quad. 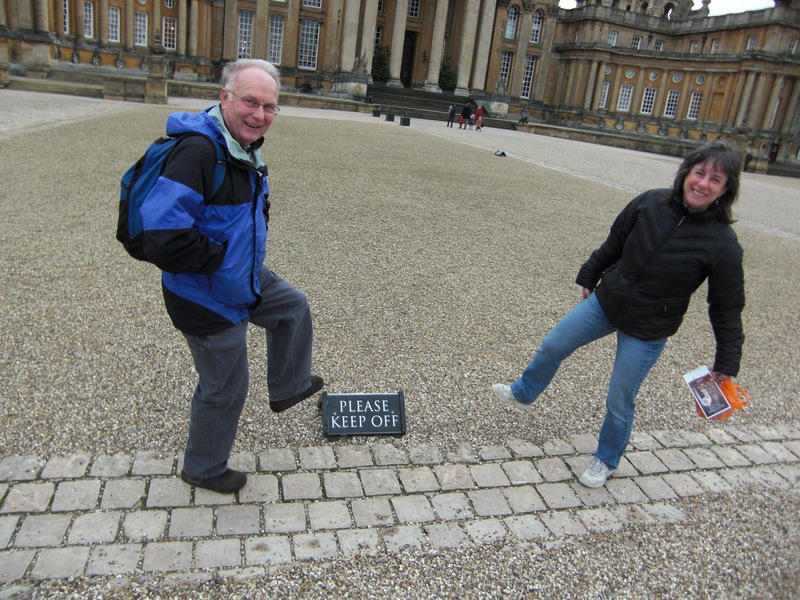 I reminded my parents, as we walked by, that we weren’t allowed to step on the grass. My mom, joker that she is, responded by putting half of her foot on the lawn. 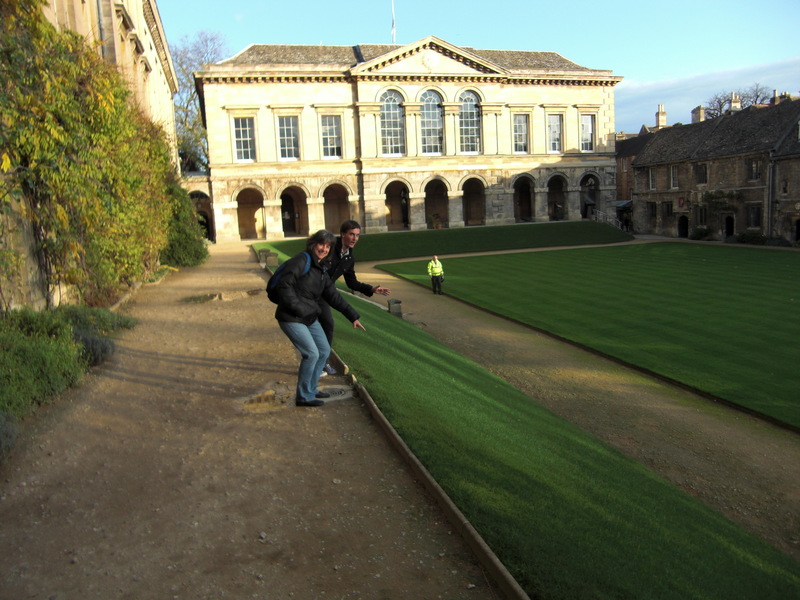 The lawn must have sensors in it, because with a matter of seconds, one of the porters was approaching us, tut-tutting, and proceeded to sternly remind us that only fellows of the college may walk across the quad. Look closely, and you can see a porter walking across the grass to yell at us. It’s not so much that they have a lot of rules here, but that they actually enforce them, that strikes me. Our student handbook says you’re not allowed to text inside the dining hall: I figured that they must have been just requesting it as a courtesy, until the other night when a staff member placed a firm hand on my shoulder and reminded me of this regulation, once again only a few moments after I had pulled out my phone. They are similarly deathly serious about the necessity of wearing gowns and white bow-ties for examinations, not using headphones in the library, and attaching the proper cover sheets to submitted essays. A professor even refused to read my first essay until I resubmitted the entire thing with the question in the title. Some of these, you actually need to know. Maybe this obsession with rules is a purely Oxonian phenomenon, the product of nine-hundred year of opportunities to accrue meaningless regulations. Anecdotal evidence, though, suggest otherwise. While I can sort of understand why they might not want us to walk on the grass, given the amount of effort that goes into maintaining it, I was a little flabbergasted at Blenheim Palace, when we were told we weren’t allowed to walk on the… gravel? Sign reads: "Please Keep Off"
Above all else, though, I think no institution better captures the English spirit of rule-abiding than the near-sacred queue. My flatmate Christoph—who grew up in communist East Germany—is even flabbergasted at the English propensity for forming lines. A few nights ago, a few friends and I found ourselves waiting in line to get into a dance at St. Anthony’s college. For whatever reason, the line wasn’t moving. Gradually, all the international students started breaking ranks and mobbing the front door. The locals, however, kept their spots, throwing looks of scorn that could practically kill. To offer another example, I was in a coffee shop earlier this week, searching in vain for a vegan pastry in the display case. Another woman walked up beside me and started looking as well. When I glanced over at her, though, she seemed to think I thought she was jumping the queue—a cardinal sin. She sheepishly moved back behind me, creating a perfect line of just two people. 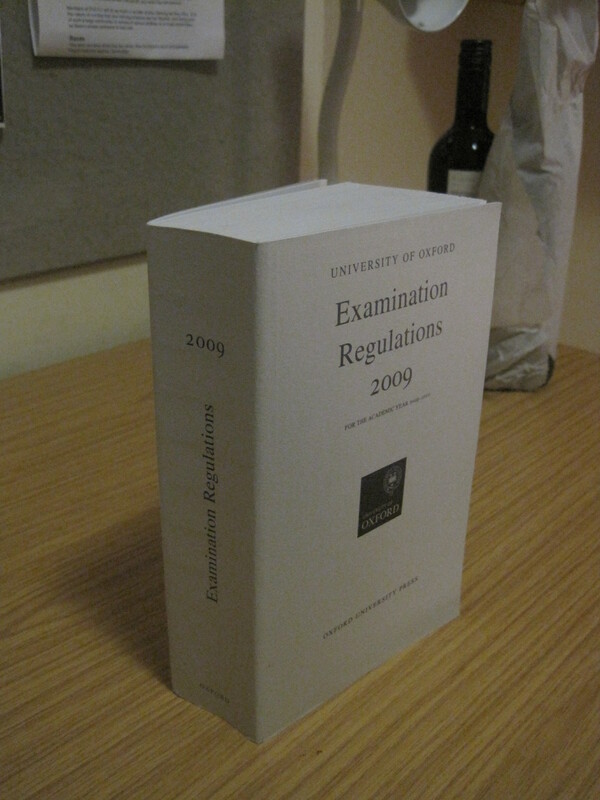 I suppose if I thought about it hard enough, I could find comparably silly rules and regulations at Princeton. To some extent, I’m cognizant of the rules here because some of them are unfamiliar, whereas to a local things like not walking on grass or actually obeying pedestrian traffic signals are internalized and thus seem perfectly natural. More than that, though, I think I’m aware of the rules here because I’ve actually been making an effort to follow them. As an undergrad, I got a kick out of pushing the boundaries of social conventions—witness my walking through Fitz-Randolph Gate freshman year, or instituting night-before-exams band gigs in Firestone Library. Perhaps because I’m in a foreign country, I don’t quite feel the same ownership over this place as I did Princeton, and as such, I’m less inclined to disrespect things that I, personally, find to be silly. The long and short of it is that being here has made me realize that I am not much of a rebel anymore—at least, not in the superficial sense that I used to be. E-mails from friends at home almost always ask if I have any “crazy stories” yet, and often close me by asking what my hair color is these days. While I’ve been to some crazy things here—ranging from crew dates to effigy burnings—I’ve been more of a passive spectator than an instigator. As for my hair, well, it’s brown, and that’s about all there is to say. Sometimes, I fear that I’ve settled down too much, but perhaps my iconoclastic side has just matured. In a sense, some of the things I’m doing here—both what I’m studying and the activism with which I’ve become involved—are a lot more threatening to a society of rules than having a silly hair style. I like this post quite a lot. And I’d add that if Oxford can balance rules about walking on the grass and texting in hall with its long history of political and religious dissidence (disobeying the rules in a much more “real” sense), it must be doing something right. It’s funny that you would mention these competing strains. I went to an Amartya Sen lecture (really awesome Nobel Laureate) in the Sheldonian Theatre the other night, and it was packed. Even once the place was jammed to capacity, there were still over a hundred people outside. When someone told the Vice-Chancellor this, he said “okay, bring them in then.” They sat in the aisles, crouched in front of the podium, and generally blocking every fire exit. This would have never happened in the U.S. – it was a lawsuit waiting to happen. So while they might be neurotic about making sure we wear gowns, they seemed to have their priorities right when it came to exposing people to an amazing intellectual experience. Right, that’s just it. I’m not sure if it’s an Oxonian thing or a British thing more generally, but it’s part of why I have a certain fondness for the mothership.